Founded as a monastic house in the late twelfth century, Newstead became the Byron family seat in 1540. Newstead's most famous owner, the poet Lord Byron, sold the property in 1818. 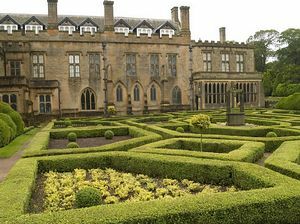 Newstead Abbey remained a private country house until 1931, when it was presented to the Nottingham Corporation for the public to enjoy. Explore the medieval cloisters, splendid Victorian room settings and the private apartments of the poet Byron. Browse in the library and marvel at the extensive panelling in the Great Hall, all reputed to have come from a single oak tree! See the fascinating collection of paintings and furniture throughout the house. A display for families invites you to try on replicas of some of Lord Byrons favourite clothes and be transformed into the romantic hero! Poet, freedom fighter, lover, athlete, scholar and 'mad, bad and dangerous to know' are all terms which have been used to describe English Romantic poet George Gordon Byron, who lived at Newstead Abbey between 1808 and 1814. Today visitors can see Byron's private apartments as well as letters, objects and furniture that belonged to the poet, including the table at which he wrote some of his poetry. Newstead Abbey formal gardens are the perfect place for a stroll along paths that meander past attractive lakes, ponds and waterfalls. The gardens have something to offer in all seasons, with spectacular displays of colour from the rhododendrons in late Spring and the Japanese maples in the Autumn. Families can explore the maze like Spanish Garden and spend some time in the children's adventure playground and picnic area. The gardens are set within over 300 acres of historic parkland with a variety of habitats important to nature conservation, including nationally significant heathland and an extensive collection of tree species. Tours of Victorian Kitchen (not on normal visitor route) last Sunday of the month - April - September. 12 miles north of Nottingham on the A60 and close to junction 27 of the M1 - follow signs for Sherwood Forest until you see the brown signs for the Abbey. Pronto Service from Victoria Centre. The Sherwood Forester Service runs right into the Park on Sundays only.